Naples attraction-guides.com - Naples, Italy attractions guide Naples Solfatara Crater, mud pits, steam jets, sulphur gas vents, volcano, information about attractions, guides, open hours, admission charges, Campanian coast, Pozzuoli train station, location and address, general tourist information about Solfatara Crater in Naples (Napoli) area, Italy (Italia) IT - Last updated 30/10/2012. Located to the west of Naples, the Solfatara Crater was known as the Forum Vulcani during Roman times. Solfatara is a large crater of a collapsed volcano, containing many impressive bubbling mud pits, sulphur gas vents and steam jets. The main Solfatara Crater is a layer of rock that is supported by the pressure of steam underneath, making the ground feel very hot and strangely hollow. Dangerous areas are always fenced off and the experienced guides at the Solfatara Crater, nearby Naples, are sometimes able to lead visitors around these areas, at certain times of the day. 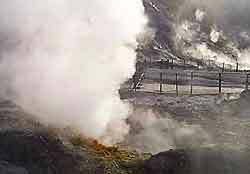 Scientists regularly monitor the huge plug of cooled lava that lies underneath the whole area, with state-of-the-art equipment. The Solfatara Crater has become one of the most popular attractions on the Campanian coast and is easy to reach form Naples by bus, or alternatively the Solfatara Crater is just a 25-minute walk uphill from the Pozzuoli train station.